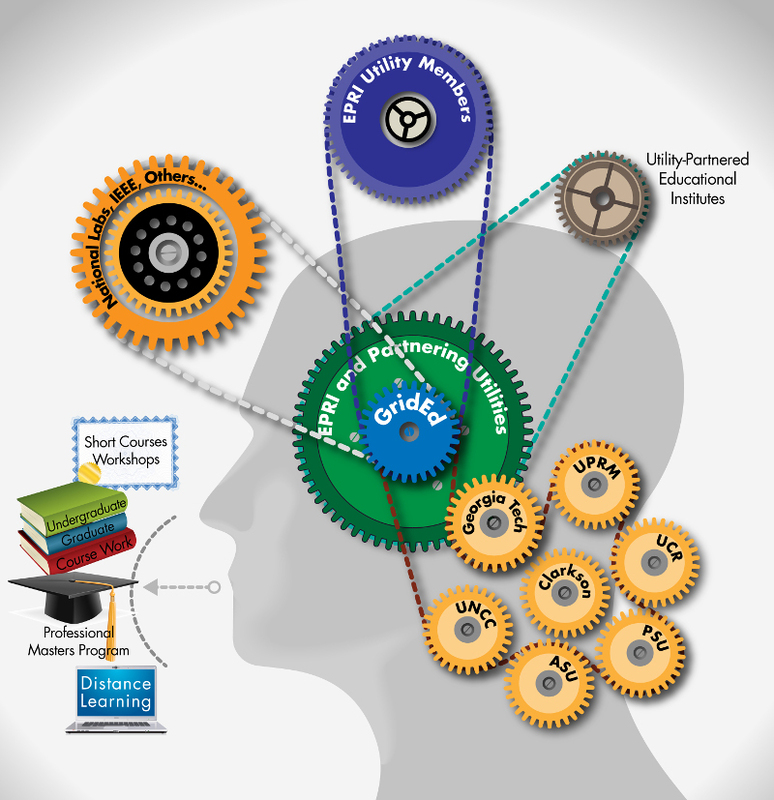 GridEd is a collaborative educational initiative consisting of the Electric Power Research Institute, seven universities (Arizona State University, Clarkson University, Georgia Institute of Technology, Portland State University, University of California–Riverside, University of North Carolina-Charlotte, University of Puerto Rico Mayaguez), and utility and industry sponsors. In 2013, the Department of Energy awarded to EPRI and its team a project known as Grid Engineering for Accelerated Renewable Energy Deployment (GEARED) which consisted of four university partners in the eastern U.S. and Puerto Rico. In 2016, the GridEd collaborative expanded to the western U.S. to form GridEd-West and three additional university partners were added. This educational initiative seeks to develop and train the next generation of power engineers so they can help shape the electric grid of the future by anticipating and fulfilling the needs of changing requirements. GridEd-East and GridEd-West leverage electric industry research to educate a future electric grid workforce by empowering new and continuing education students, not only to become competent and well-informed engineers, but also to participate and influence major technological, social, and policy decisions that address critical global challenges. The electric power system is beginning to change fundamentally and profoundly—rapidly in some geographical areas, inevitable in all—with the rise of distributed energy resources (DER), such as small natural-gas-fueled generators, combined heat and power plants, electricity storage, and solar photovoltaics (PV) on rooftops and in larger arrays connected to the distribution system. GridEd's charge is to support and inform a growing knowledge base of these technologies. Realizing the full value of DER investments requires a hub-and-spoke distribution grid that accommodates a two-way flow of electricity. Through a combination of technological improvements, policy incentives, and consumer choices in technology and service, the role of DER will become more important in the future. DER and grid-provided power do not compete with each other; they are complementary sources of power when they are jointly planned. Today's grid, especially its distribution system, was not designed to accommodate a high penetration of DER while sustaining high levels of electric service quality and reliability. The technical characteristics of certain types of distributed generation, such as the variability and intermittency, affect the grid quite differently from traditional central power stations. To fully realize the value of DER and to serve all consumers at standards of service quality and reliability they demand, the distribution grid needs to be designed to expand its capability to accommodate DER operation. DER offers benefits to the grid in the form of reduced capacity requirements, forming a symbiotic relationship. The foundation for creating this symbiotic relationship is what EPRI is calling the Integrated Grid. Its realization requires utility technical staff that can plan and operate such a system. Engineers and planners that are tasked with developing and operating the future grid will require new and innovative knowledge. GridEd is dedicated to fulfilling this training role. The Electric Power Research Institute (EPRI) along with electric utility partners and universities have been selected by U.S. Department of Energy Solar Energy Technologies Office (SETO) to receive a $6 million award to launch the Grid-Ready Energy Analytics Training (GREAT) with Data initiative. The project will design, develop and deliver professional training materials to train and recruit power systems workers and university curricula for new engineers and computer scientists. It will also develop certifications, credentials, qualifications, and standards for the training and education needed in the electric utility industry workplace to transform the grid. 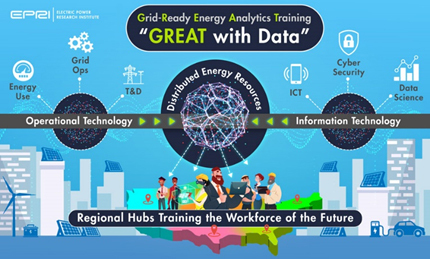 The GREAT with Data initiative will help merge grid Operations Technology and Information Technology to enable the integration of distributed energy resources (DER), especially solar, through enhanced industry coordination and workforce readiness initiatives by training, educating, and recruiting qualified personnel into the electric utility industry. integration of solar photovoltaic and other synergistic distributed energy resources such as energy storage, electric vehicles, demand response, etc. Multiple delivery mechanisms from live-in person instruction to computer or cloud based digital training modules will be used. Target audiences include engineering, applied mathematics, and computer science students, professional engineers, executives, data scientists, and increasing diverse talent pools (e.g. veterans, women, and other underrepresented minorities) in the power industry. Electric utilities rely heavily on regional resources from which they obtain assets and people. In support, five strategic regional training hubs across the United States will prioritize feedback and guide content development and delivery to meet regional supply principles. Multiple training repository platforms, a data analytics center of excellence in power systems, and train the trainer workshops will facilitate program expansion. Further, innovative training simulators and digital learning platforms that use both augmented and virtual reality where trainees get hands-on experience with virtual assets will be explored. Utility participants on the project development team include: American Electric Power, Austin Energy, Bonneville Power Administration, Con Edison, Duke Energy, Entergy, FirstEnergy, Lincoln Electric System, Portland General Electric, Riverside Public Utilities, Salt River Project, Snohomish Public Utility District, Southern California Edison, Southern Company, Tennessee Valley Authority, and the Western Area Power Administration. Collaborating universities include: Stony Brook University; University of California, Riverside; Virginia Tech; and Washington State University.